What do you know about the California Wine Region? Do you know how much wine California produces? Many people enjoy tasting wine but some people, like me, have no idea how wine is produced in our state. You have got to read this article. It help me to understand the complexity involved with wine making. We have invited John Tools an expert on California Wine Region to educate us on the wine development on the Central Coast and in the state of California. Within the state, there are approximate 4,500 wine grape growers; a testament to the size and importance of the wine industry in California. In 2006, the California wine industry had a $51.8 billion dollar economic impact on its own state and a $125.3 billion dollar impact on the entire United States. The wine industry in California is easily the most profitable of any other area in the Unites States and its wine's are among the top in quality around the world. Due to different growing conditions within the state, the California wine producing areas are separated into five major regions: North Coast, Sierra Foothills, Central Coast, Central Valley, and Southern California. Each of these regions can be divided even further into sub-regions called appellations (which are often counties) that many people who are not even familiar with wine will easily recognize by name such as Napa, Sonoma, and San Joaquin Valley. When a wine label contains a specific appellation, it means that at least 75 percent of the grapes used within the wine were grown within that specific region. Wine labels can also contain two or three appellations to classify the different grapes used within the wine if the percentages are specifically noted as well. The climate range in California wine country varies from region to region which allows for superb production of many different types of perfectly grown grapes which results in many different varietals. Elements of the weather, such as the cool offshore breezes that cool the Sonoma County vineyards, are extremely important in the distinct growing condition needs for specific wine grapes. The most important varietals produced in the California wine country are chardonnay and cabernet, though many other varietals from the region are massively popular such a pinot noir. The California wine region has a reputation for producing a high-quality wine to be enjoyed in a relaxed setting among friends, just the way its biggest fans would want it. Merlot is a popular thin-skinned red wine grape that is believed to be descended from the Cabernet Franc grape and was first recorded in Italy in 1832. It is used for both the purposes of blending inspired by the Bordeaux wine region of France and also for the production of straight varietal wine. In the 1990's particularly, Merlot experienced a huge surge in popularity and became the new trendy wine but its popularity has proved to possess staying power. In 2003 there were over 50,000 acres in California devoted to the Merlot grape alone. Because Merlot is not quite as rich as some other red wine varietals, it is still fairly flexible in its easy pairings with many popular dinner choices. Because it is a medium-bodied wine, it will pair well with veal, meatloaf, sausages, and hearty pasta dishes. Additionally, since the 1960's, Cabernet Sauvignon has been the most common varietal term for red wines due to it's wide appeal and critical acclaim. Because it is so widely in demand in many wine circles, Cabernet Sauvignon becomes easily subjected to inflation-related cost increases as demand from wealthy wine-lovers drives prices upward. On the other hand, Cabernet Sauvignon's parent grape Cabernet Franc is less popular because it is a less desirable grape than its grape offspring. 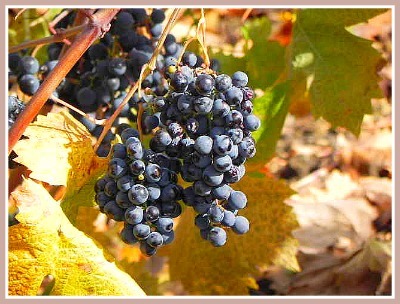 However, it is quite often used as a blending element in mixed varietal wines, particularly with Merlot. A general tip for most novice wine consumers is that most bottled wines labeled Cabernet belong to the Cabernet Sauvignon family of grapes, rather than the Cabernet Franc. The Best Wine is grown in California Wine Country! Cabernet Sauvignon grapes thrive best in regions with long growing seasons due to a warm climate and reaches maturity quite late in the season. It also grows well in slightly arid areas with well-drained soil. These elements will allow the Cabernet Sauvignon grapes to mature with a fruity taste, rather than the more herbal flavor that arises from the grape's exposure to increased moisture and excessive soil-based nutrients during the growing process. The grapes themselves are comparatively small with a tough outer skin that protects the grapes from many elements. They are considerably resistant to disease and can be viewed as a fairly hardy grape varietal. Cabernet Sauvignon is also one of the best aged wines. It is traditionally aged in small oak barrels for up to eighteen months before bottling. This aging period allows the wine to develop a greater complexity and depth of the flavors it encompasses. Some of the flavors which are most often attributed to Cabernet Sauvignon are: dark cherry, black currant, olive, pepper, cedar, and tobacco. Cabernet Sauvignon's can also sometimes have spicy or earthy taste profiles as well. The Shiraz wine grape has an interesting history and place in the contemporary wine world as well. Generally described as "New World" wines, these wines are generally thought to be more fruity in their predominate flavors in opposition to the "Old World" wines which are often labeled Syrah. Because both variations of wine are derived from the same grape genetically, the differences between them are minimal to say the least. Some wine purveyors even maintain that the distinction between Shiraz and Syrah is in relation to style preferences only. The Central Coast is the heart of California Wine Country! Zinfandel often gets a less-than-stellar reputation among the most pretentious of wine drinkers as it has recently held the reputation of being a "starter wine," especially for women, due to its popular sweet taste in the 1980's and 90's. However, in the past several years, winemakers have responded to this prejudice against Zinfandels by improving the complexity and balance of flavors within their wines to make them a more palatable choice to the savvy wine consumer's sophisticated sense of flavors. What makes a wine more appealing to wine lovers? Complexity and fullness of the flavors are a few of the key aspects of a well-crafted wine. In Zinfanfels, a few of the most popularly described characteristics of the flavors are blackberry, raspberry, cherry, cloves, black pepper, and anise. However, depending on the complexity of the Zinfandel, many other levels of flavors may emerge, especially through a tasting in which you carefully give your attention to the subtleties released within the entire experience of the wine. Another interesting characteristic of Zinfandels is that they are also often mixed with others such as Cabernet Sauvignon or Petite Syrah. Because Zinfandels range from lighter-bodied whites to quite robust reds, they are no steadfast rules for which foods to pair with them. Some zinfandels do possess enough body and presence of flavors to drink even with a hearty steak or rich chocolate dessert. The lighter zinfandels can be a great pairing for Latin American and tropically-inspired foods. Zinfandel originates from a distinctly American red-skinned Zinfandel wine grape that is used to make both red and white Zinfandels. Formally named in 1832, Zinfandels are traditionally defined as an American varietal and can occasionally be quite difficult to locate in overseas markets. It was recently discovered that Zinfandel grape is genetically identical to the Primotivo grape native to Italy. This discovery begins explains the previously unknown heritage of the Zinfandel grape's development. Californian vineries have come to embraced Zinfandels as their own characteristic varietal, leading the reputation of Zinfandel to become a representation and branding image for California wine. Some of the most popular regions for the production of Zinfandels are: Napa Valley, Sonoma, Mendocino-Lake, Central Valley, Bay area, Sierra Foothills, and Southern California. However, Zinfandel's aren't exclusive to California and can be produced in American regions as distant as North Carolina and Tennessee, as well as overseas locations to which the Zinfandel grape has been exported. Chardonnay has become the most popular white wine in America in the past few decades. The reasons for this development are varied. The first is that Chardonnays possess a widely appealing taste often consisting of fruity and full-bodied buttery notes. Due to the wine's versatility, it can possess many distinguishable variations of flavors and vintners can even mix Chardonnay with other varietals as a way to experience new flavors with blended wines. One of the other most important reasons for its popularity is that it's widely available and can be quite inexpensive due to the small, hardy Chardonnay grapes resistance to many diseases and thus easier to grow in many conditions. Thus, the demand for Chardonnay becomes easily to fill, despite the fact that Chardonnay grapes are more delicate in the wine-making phase of development. Today's Chardonnays are less-heavily subjected to oak fermentation as public preference has shifted to lighter and crisper versions of this varietal. The reason for this preference can be viewed as a return from the past several decades in which all chardonnays were so heavily processed with malo-lactic fermentation and other aging techniques that even the most distinctive Chardonnays began to lose their distinctive flavors. Unlike many other wine varietals, Sauvignon Blanc is not frequently aged in oak barrels because it often departs an unfavorable taste combination. However, Sauvignon Blancs are frequently blended which is a technique that calms their occasionally abrasive tastes. Blending Sauvignon Blanc with Semillon (another wine varietal grown primarily in France) is a popular practice, especially in France's legendary Boudreaux wine region, as the Semillon adds a fig flavor and softens the overall taste profile of the Sauvignon Blanc. The ratio of Semillon blended with the Sauvignon Blanc ranges on the region and occurs primarily in France. However, some versions are comprised of 70 percent Semillon and 30 percent Sauvignon Blanc and other varieties are comprised of the nearly inverse ratio of 75 percent Sauvignon Blanc and 15 percent Semillon. These blends are a perfect option for the wine consumers who enjoy some of the flavors of Sauvignon Blanc but find it a little too aggressive for their palates. Six Reasons to Drink California Wine! 1. California Wine Country Wine is the Best! 2. California Wine Country is California Made! 3. California Wine Country Wine Taste Great! 4. California Wine Country Produces Variety! 5. California Wine Country has easy Access! 6. California Wine County Wine is Reliable! I hope you gained some insighted into the California Wine Country. When you visit the central coast your pronunciations of these different types of wine while you are tasting wine in one of many wine tasting shops.